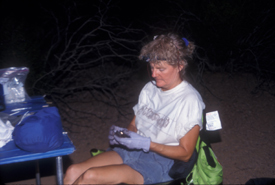 I organize, coordinate, and conduct Arizona-Sonora Desert Museum (ASDM) research on birds and mammals. To do this research, I collect data on wildlife and habitats in the field, and spend a lot of time outdoors in interesting places. I also write technical and peer-review articles, books, and book chapters on my research. 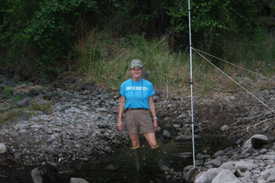 I obtain funding for my research and participate in outreach efforts for ASDM conservation programs. I collaborate with ASDM partners from other institutions, universities, and organizations in the U.S. and Mexico. I act as an expert resource in my field of expertise for other ASDM departments. I am also an educator and participate in workshops, lectures, training, and ASDM Public Programs on birds and mammals of the Sonoran Desert. What type of schooling or experience do you need in order to be a Bat Biologist? You should have a Bachelor's of Science degree in wildlife, animal science, ecology, or related field. An advanced degree in biological sciences or conservation biology is also desirable. You should also have at least three years of professional experience in applied conservation or field research in natural history of the region that you are working in. Experience with bats is also desirable. I love working in the field with the numerous species of bats that occur in the Sonoran Desert. I also love training and educating other biologists, students, and professionals for bat handling and research. The nocturnal life of creatures is invigorating and when you study bats you become a part of that exciting “night-life”! In my work, I cannot imagine anything better than an evening filled with coyote howls, various types of owls calling, an occasional scream from a mountain lion, a curious bear or skunk, a deer snorting an alarm call, and bats flying over and around you throughout the night! It doesn't get any better than that for a Bat Biologist! I don't enjoy writing proposals for funding or sitting in front of a computer for long periods. Office work is always difficult for me since I would rather be working in the wilderness chasing bats! I have 2 different “seasons” for my job as a Bat Biologist. One part of my job is the office work and usually occurs from October to March. During this period, I am writing proposals, reports, publications, attending meetings, applying for permits, hiring people to help me in the field, and participating in educational outreach. Proposal and report writing are important aspects of the grants that I carry out each year. The grants provide the funds that are needed to carry out the research and to hire people to help me in the field. Publications present the important findings of the research. The second part of my job is the fieldwork and usually occurs from April through September. During this time, I have to schedule the fieldwork with the National Parks, wildlife preserves, and private landowners. Equipment and field gear has to be obtained, maintained, and checked. During a typical field day, I will pack up all of my field gear (equipment, permits, camping gear, food, etc.) in the vehicle, meet my field help, drive to the study site, unload the gear at the research headquarters (where we are staying), and then hike to the study area. We set-up our nets, table, and chairs for the evening work. We take pictures and gather the GPS data at the study site. We usually work from 5 p.m. to 1 a.m. at the study area. We collect data on the bats we capture in the nets and then release all of the bats. After the work is complete, we hike back to the site where we are staying during the day. We then sleep, eat, and prepare for the next nights' fieldwork. Why do we need to study bats? Bats are an important part of the Sonoran Desert and our ecosystem. Bats are important pollinators for many of the tall cactus in this area and are the primary predators of night-flying insects. One small bat can eat as many as 600 mosquitoes in one hour! One of the most remarkable abilities of bats is that they can fly and are the only mammal that can do this! Their navigational abilities are unique and they can “see” with their ears! But there is a lot that we do not know about the natural history, migratory movements, and behavior of bats. Our continued studies with bats will provide important information to biologists, resource managers, educators, and all those people who live in our fragile environment. All wildlife and a healthy ecosystem are important to our survival and the continued survival of our planet. What is your favorite bat species? I have a great respect and love for all bat species. Each species is different and fills an important niche in our ecosystem. I enjoy working with the tiny western pipistrelle that is no larger than a butterfly or the greater western mastiff bat that is the largest bat in the United States, as well as the other 26 species of bats that occur in Arizona. My work in Mexico has allowed me to work with several species of bats that do not occur in Arizona. The hairy fruit-eating bat and the Davy's naked-backed bat are two of my favorite bats in Mexico. The hairy fruit bat is a large bat that feeds on fruits in the dry tropical deciduous forest of Sonora, Mexico. The small Davy's naked-backed bat is a beautiful red-furred bat with a totally naked-back and is a very gorgeous bat indeed! This bat feeds on small insects! I guess it would be difficult for me to pick only one favorite bat species since I love them all!